The simply-designed Body-Solid Strengthtech EXM2500S is a well-built and fully-featured home gym, which has been on the market since 2009, giving an option to those who want to work out the whole body without spending a couple grand. Now it’s time to move beyond bare specs to consider customers’ opinions and the benefits of various features – to weigh the good and the bad.It’s one of our top picks of the best home gym of this year. Best buy – The Body-Solid StrengthTech EXM2500S was named “best buy” by a leading consumer magazine. Selectorized weights – There are no tedious cable changes to add weight. The selectorized weight system allows you to merely move the selection key position to choose the weight you lift. Smooth – Customers like its smooth action. Some complain about jerkiness at higher weights, but proper maintenance – cleaning and lubrication – tends to clear this up. Adjustable seat – Its adjustable seat height gives the right fit and optimal range of motion. Durability – The 12-gauge steel provides durability and prevents dings and warping. The powder coat finish, applied electrostatically, is scratch-resistant. Both of these features keep your home gym looking like new. Cables – It has military-spec, nylon-covered cables, able to withstand 2200 pounds. Broken cables are a leading cause of injury for users of home gyms. Strong cables bring peace of mind. Padding – The DuraFirm pads are thick and provide comfort and lumbar support. You want your set to end because you’re actually tired, not because parts are cutting into your skin, and you certainly don’t want to gain fitness at the cost of your back’s health. Warranty – The Body-Solid StrengthTech EXM2500S carries a Lifetime warranty, including pads, pulleys and cables, or as Body-Solid states, “Everything is covered forever.” Nice. Assembly – Many customers say the assembly of the EXM2500S is very difficult, but others say they handled it fine, though it took a while. Just lay out the pieces first, read through the directions thoroughly, and make sure you have or can borrow a set of socket wrenches and a crescent wrench. Also, customers warn it’s crucial to avoid tightening the pulleys until after the cable is run through. 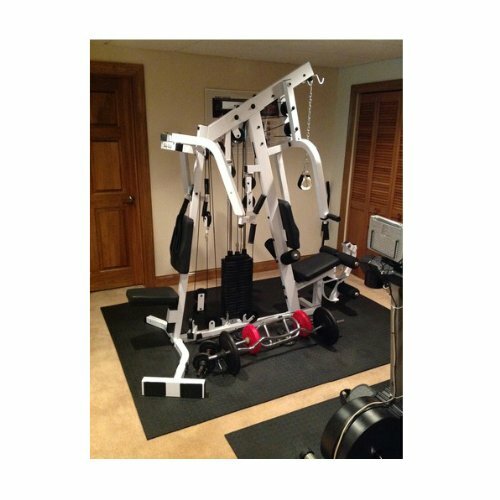 All this said, it must be harder than average to assemble, because most customer reviews for this home gym devote half to most of the review to the subject of assembly. Space – It requires a generous amount of room, especially if you want to use the rowing machine function. The Strengthtech EXM2500S is 83 inches high and has a 51” X 83” footprint. Missing feature? – There is no leg press station. To be fair, most home gyms at this price have no leg press, among other things. However, if the leg press feature is important to you, take a look at the Powerline P2X Home Gym. 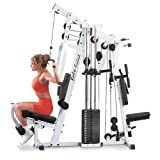 It has a leg press and most of the same features as the Body-Solid for about the same price. However, it has only a 160-pound weight stack, thinner steel frame, and only a 10-year warranty. If space and price are an issue, consider the Body Solid G1S Selectorized Home Gym. The G1S has a decidedly smaller footprint and lower price than the EXM2500S. The G1S has a 150-pound weight stack and no pec station and lacks some of the ergonomic improvements of the EXM2500S, so there’s less padding and lumbar support. Overall, the Body Solid EXM2500S Home Gym is a fantastic buy. For the price, you get a thorough workout, a well-built machine and a fantastic warranty. It has few mechanical problems and many happy customers.